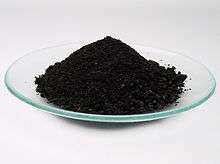 Iron(II) oxide or ferrous oxide is the inorganic compound with the formula FeO. Its mineral form is known as wüstite. One of several iron oxides, it is a black-colored powder that is sometimes confused with rust, which consists of hydrated iron(III) oxide (ferric oxide). 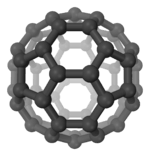 Iron(II) oxide also refers to a family of related non-stoichiometric compounds, which are typically iron deficient with compositions ranging from Fe0.84O to Fe0.95O. ↑ H. Lux "Iron (II) Oxide" in Handbook of Preparative Inorganic Chemistry, 2nd Ed. Edited by G. Brauer, Academic Press, 1963, NY. Vol. 1. p. 1497. ↑ Science Jan 2012 Archived January 24, 2012, at the Wayback Machine.